You may think you’ve seen everything that’s cool around. Wacom Techno Cintiq 21UX 21-Inch Interactive Pen Display is so stunning and new you’ll ask yourself how you made it before. It’s a tablet sporting the well-known Wacom quality plus a 21-inch UXGA (1600 x 1200) Pixel LCD display. That means you’re going to do PhotoShop editing like never before: a pen display that allows you to directly address each and every pixel on the screen. Resizing and contour operations will be outrageously easy and powerful! The user-defined keys on both sides allow for even more customisation of both PhotoShop and your workflow too. We tested the Wacom Techno Cintiq 21UX along with a MacBook (the white one, not the latest unibody!) and were amazed by the results! With a 21.3″ TFT diagonal display, the Wacom Techno Cintiq 21UX delivers a highly sensitive pen-on-screen experience and a generous active area for working directly on large images, concepts, and designs in the most natural way possible. Working directly with the pen on screen is a natural motion that gives you an unprecedented degree of control and allows you to take advantage of natural hand-eye coordination, helping you work more intuitively and noticeably faster. The display’s completely flat surface allows the hand and pen to glide over the surface of the Cintiq without bumping into any bezels or borders. A dynamically adjustable stand allows you to rotate the display up to 180-degrees in each direction, incline the display from 10-degrees to 65-degrees, and even remove it for comfortable lap use. The bottom line? It goes for a whopping US$1,960.99 but you’ll get the very best drawing & editing tool around! 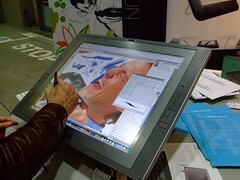 Wacom delivers and has the same proven technology of the bigger brother! For US$899.10 you can get the Wacom Cintiq 12WX 12-Inch Pen Display with diagonal WXGA (1280 x 800) resolution which at just 4.4 pounds, combines the advantages of a wide-format LCD monitor with Wacom’s patented, professional pen technology. The Wacom Cintiq 12WX integrates seamlessly into multi-monitor environments to supplement a primary display or to control other displays. Alternatively, you can use the Cintiq 12WX as a stand-alone display. Its ergonomic design and lightweight profile make it easy to add it to your laptop, desktop, or high performance workstation. Square Group Ltd in association with Adobe, Apple and a slew of other partners organized an Adobe Creative Suite CS3 seminar at BFI Southbank in London last Tuesday, May 15, 2007. The seminar featured presentations from both Adobe and Apple about the new features of the many applications that make up Adobe’s new crown jewel, CS3, alongside demonstrations of related products from the likes of Eizo, Wacom, Extensis, HP and G-Tech. SourceCrowd was in attendance and can bring you an exclusive report from the event. Before the seminar, attendees were able to peruse stands with a few interesting products on show. Eizo wowed the crowd with its stunning professional quality displays like the ColorEdge CE240W sporting hardware colour calibration, 14-bit color processing and easy profiling. Extensis was showcasing two of its software products for asset management: Suitcase Fusion , a font manager to organize, categorize and activate/deactivate fonts on the fly, and Portfolio , a complete multimedia files management tool. HP was showcasing the HP B9180 Photosmart Pro Printer , an eight-tanks pigment ink powerhouse which demonstrated stunning results on some of HP’s custom papers (especially impressive were the results on canvas-textured paper). Wacom had both the A4 Intuos3 graphic tablet and the Cintiq 21UX display available for hands-on demonstrations, making precise editing of pictures a breeze. Last but not least, G-Tech had the whole range of its external high speed hard drives solution on display. The elegant silver enclosures sport the latest in eSata and Firewire connections on the G-Raid2, G-Drive 250GB External FW400/USB2 , G-Mini and G-Safe, with high-end fibre-channel RAID solutions also available in the G-Speed models. Then it was finally time to immerse into the presentation! The first speaker was Richard West, Apple Business Development Manager for the UK and Ireland. He started by stressing how important it is, in a multimedia communicational landscape, to put to good use the plethora of different ways that businesses have to reach clients, by customizing communications to target and focus on different markets. 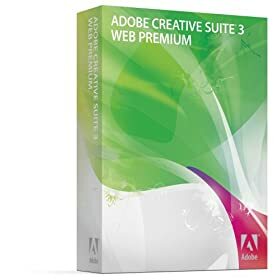 Adobe Creative Suite CS3 , he argued, is the tool of choice to do so, allowing the use of a single creative process for multiple disciplines through its multiplicity of applications. Since output is so important to the designers and developers who use CS3, he then went on to demonstrate how colour calibration devices (in this case, the Pantone Huey Pro MEU113 ) can work in tandem with OS X ColorSync Utility (found in the Applications>Utilities folder) to prevent disparity between screen output versus print/web output. In particular he showed how it is possible to compare colour spaces graphically, and onscreen proofing of different colour spaces just by dragging and dropping images on the application. Microsoft’s Windows has “borrowed” the same functionality for its latest OS, implemented in Vista under the name Windows Colour System (located in the Control Panel). Stay tuned for the second part of our report - coming soon! Wacom has announced the introduction of the new 15″ DTF-521 LCD tablet, adding a little brother to its DTF line of business and education oriented writing instruments (which had debuted with the 17″ DTF-720 and the 21″ DTF-2100). The new product sports an XGA resolution screen with 1024 x 768 pixels and 16.2 million colours. The tablet/screen hybrid comes with an adjustable stand (140 degrees horizontal to 130 degrees vertical), and the standard cordless battery-free pen with 512 pressure levels. According to Wacom, the DTF-521 offers “a natural tool for freehand writing, annotating and navigating directly with the pen on the screen”, allowing huge amounts of freedom during a presentation or lesson. A VGA-out port assures easy connection with external screens and projectors. The tablet has a RRP of $1624 (£699 excluding VAT in the UK, where it is known as the PL-521), and is compatible with both Mac OS X and Windows PCs (including Vista support). You are currently browsing the archives for the Wacom category.